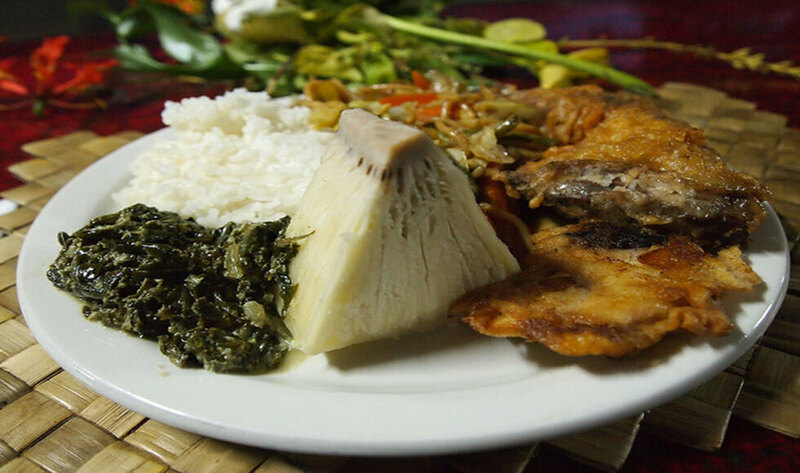 In Samoa, food brings friends and family together. Seafood, fruits and vegetables are the major food items. Some of the popular seafood include snapper, crayfish, octopus, masimasi and tuna. Most of them are caught fresh everyday for the meals. Yams, talo (also called taro), coconut, bananas and breadfruit are some of the fruits and vegetables that are cultivated on the island and used in preparation of food. Coconut, in particular, is used as an ingredient in many of the local dishes. On Sundays, lunch, which is called toano’i, is a social event during which several families get together and eat food made in umu (earth oven). Meal includes a whole pig, an array of seafood items and baked taro. In traditional cooking, hardly any oil is used. There are two local delicacies that should be tried at least once. The first is called palusami – a dish, which has a rich taste that is made with taro leaves that are cooked in coconut cream. The second dish is oka – it is a raw fish, like tuna, and also cooked in coconut cream. There are two local alcoholic drinks that you can try: the Kava and the Vailima beer. Corned beef is also taken as an accompaniment to many dishes.